Writer and broadcaster Mark Lawson has been named as the final judge for this year’s international competition for poetry and medicine, the 2011 Hippocrates Prize – one of the highest value poetry awards in the world for a single poem. The BBC Radio 4 Front Row presenter joins Wales’ first national poet Gwyneth Lewis and Chairman of the National Health Inclusion Board Professor Steve Field CBE on the distinguished judging panel. This is the second year that the Prize has taken place, organised by a joint team from the University of Warwick’s Department of English and Comparative Literary Studies and the University’s Medical School. There is a £15,000 award fund for the prizes, which will be given in an ‘open’ category, which anyone can enter, and in an ‘NHS’ category which is open to National Health Service employees, health students and those working in professional organisations involved in education and training of NHS students and staff. With a 1st prize for the winning poem in each category of £5,000, the Hippocrates prize offers one of the most lucrative prize pots for a single poem. And one poet, who started her publishing career early, is keen to inspire other young wordsmiths to get involved in the Hippocrates Prize. “Having my poetry published when I was sixteen altered my life. It made me believe I could actually be a writer, and vow to work as hard as I could to make it happen. “Our education system has for decades placed a divide between the arts and the sciences and yet great scientists and medical pioneers draw on creative thinking to break new boundaries. 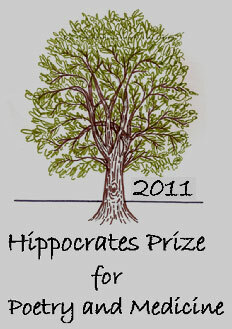 The closing date for the 2011 Hippocrates Prize is 31st January 2011. The Awards will be announced at an International Symposium on Poetry and Medicine on 7th May 2011. All winning and commended poems will be published in a further Anthology of 46 poems. The inaugural 2010 Hippocrates Prize attracted more than 1,600 entries from 31 countries. The winner in the ‘open’ category for 2010 was New Zealand poet CK Stead and in the ‘NHS’ category Wendy French, who facilitates creative writing for NHS professionals. Clare Pollard has published three collections of poetry with Bloodaxe: The Heavy Petting Zoo (1998), Bedtime (2002) and Look, Clare, Look! (2005). The first of these was largely written while she was still at school and she was subsequently chosen by the Poetry Society as one of Poetry Review’s “New Poets of 1996” at the age of only 16. She went on to win an Eric Gregory Award in 2000. Michael Hulse is a poet and translator of German literature, and teaches creative writing and comparative literature at the University of Warwick. He is also editor of The Warwick Review. His latest publications are: The Secret History (poems, Arc) and The Notebooks of Malte Laurids Brigge (translation of Rilke's novel, Penguin Classics). With Donald Singer he co-founded in 2009 the International Hippocrates Prize for Poetry and Medicine. Themes for prize entries may include the nature of the body and anatomy; the history, evolution, current and future state of medical science; the nature and experience of tests; the experience of doctors, nurses and other staff in hospitals and in the community. Other topics might include experience of patients, families, friends and carers; experiences of acute and long-term illness, dying, birth, cure and convalescence; the patient journey; the nature and experience of treatment with herbs, chemicals and devices used in medicine. There is both an ‘open’ category, which anyone can enter, and in an ‘NHS’ category which is open to National Health Service employees, health students and those working in professional organisations involved in education and training of NHS students and staff. Poems entered must be of no more than 50 lines. Submissions must be anonymised, contact details provided separately from title and text of a submitted poem. All submissions must be made by the deadline of 31st January 2011, and must be accompanied by an entry fee (£6 per poem). For more details please visit the website www.hippocrates-poetry.org. In each category there will be: 1st prize £5,000, 2nd prize £1,000, 3rd prize of £500, and 20 commendations each of £50.